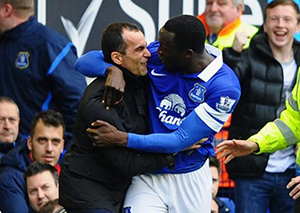 On Sunday afternoon at Goodison Park, we got all of the above and much, much more. Travelling to the game I felt more excited than I had done in a while, the build up amongst our fans and everyone associated with the Club was one of optimism, hope and confidence. I had similar thoughts and hopes before the Cup game at the Emirates and look what happened there, but on this occasion I wasn’t let down by my Everton side, I was left feeling overwhelmingly proud as I witnessed one of the most accomplished displays I had seen from the Toffees for some time. From the moment Steven Naismith threw in that early tackle on Mikel ‘arm wavin’ Arteta, the game was won. Arsenal brought good numbers – which is always a refreshing sight – but they would have been left disappointed by their side’s performance which lacked fight, desire, leadership, energy and was devoid of confidence. Everton had all of this and more, and it resulted in the home side running out 3-0 victors and going within just a point of Wenger’s fourth placed side and we now find ourselves in the driving seat for Champions League qualification. Every single Everton player played their respective parts at Goodison Park, and they, along with Roberto Martinez and those Blues on the terraces, should all have been awarded Man of the Match collectively. We were brilliant, we looked lively from the off, and even though Captain Leon Osman, who started well, was forced off with an early blow to the eye, Barkley’s introduction just added to the feeling of optimism and it wasn’t before too long that we got into our stride. Mirallas was looking up for it (he often doesn’t) and big Rom was being deployed out on the right, meaning Nais started up top on his own. Again another tactical masterstroke by Bobby, or as cringey as it might sound ‘the Spanish gift that keeps on giving’ ! It was the aforementioned Belgian striker that created our first goal, shooting from the edge of the area and forcing a save from Chezny between the Arsenal sticks. The Pole could only parry into the path of the onrushing Steven Naismith who stayed calm and slotted at the Park End. 1-0 up quarter of an hour in. We looked bang in the mood, and the rest as they say, is history. Howard was forced into a stop from Podolski and there was half chances for both sides throughout the first half but on 34 minutes we doubled our lead through Romelu Lukaku – who had one of his best games in royal blue. The 20-year-old cut in from his right hand position and the Goodison faithful urged him to shoot, and after shuffling past a couple of Arsenal defenders he did, hitting a fierce drive past the sprawling Gunners ‘keeper and into the net. 2-0 – Cue bedlam. The mood at half time was one of anticipation and enjoyment and if the first 45 was a pleasure for Evertonians to witness, the second 45 was a dream. As soon as the whistle went for the restart we literally took the ****. We oozed confidence, class and never gave Arsenal a minute. Admittedly when you are up against a side like the North Londoner’s you can be hit on the break or by a moment of quality but think back Blues, did you feel threatened by them at all in the second half? I certainly didn’t. There was no ‘taking the game to Everton’, no upping of the tempo, no leadership and no sign of a comeback – and Everton took complete advantage. The ‘ole’s’ rung out as Everton passed their way through the game, and just after the hour mark the party atmosphere increased to County Road levels when Arteta deflected the ball into his own net to make it 3-0. Mirallas did brilliantly and probably deserved to be awarded the goal himself but reading ‘Arteta OG ’61’ made Evertonians’ day go from excellent to superb. Some Arsenal fans have questioned our treatment of the Spaniard but the former Toffees midfielder hasn’t helped himself since leaving Goodison Park for the bright lights of the Emirates (echoes of the David Moyes situation, you could say) and although we do hold some good memories of Mikel at Everton, he deserved all he got yesterday in my opinion. If you act like a tart, expect to get it from our fans. The oggy capped an all-round poor day for Arteta who captained a side that looked weak and never really looked up for the fight. Do they want Champions League? Do they just expect Champions League? I tell you what, we want it, and yesterday we showed them that we will chase it all the way. During the remaining half an hour of the game we had more chances, and Arsenal made changes and had some of their own, but Howard, Stones and Distin stood firm and kept an impressive clean sheet which just put the icing on the cake for Martinez’ side. Coleman took the mick out of Carzola with some unbelievable tekkers and by the time the whistle had blown for full-time L4 was bouncing, the Arsenal players looked embarrassed and Everton had earned their most impressive three points of the season. I look back at other performances from this campaign and especially pre-Christmas – we put in some fine displays, mainly away from home, but I think this victory beats them all. It was a team effort, in fact it was just an Everton effort. Everyone did their bit. From Howard between the sticks to Naismith up top, they all deserve huge praise, as does Martinez, his staff and of course us the supporters too. I haven’t seen us play with such assurance for some time and although in the first half we probably didn’t get out of second gear, during the second period we showed Arsenal and the rest of the Premier League that we mean business, and we are here to stay. 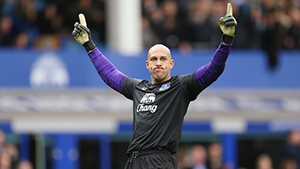 Tim Howard made great saves and was reliable, John Stones was fantastic, as was Distin, Coleman was his menacing self down the right, McCarthy and Barry enjoyed midfield dominance once again, Mirallas pulled his finger out and showed what he can do, meanwhile Ross Barkley played like he was on the school yard, full of tricks and brilliance. 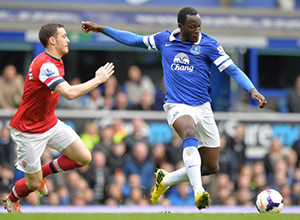 Lukaku put in a superb display in a different position and Steven Naismith – well what can I say. 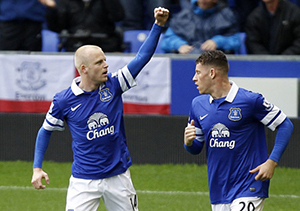 Naismith is a prime example of a player playing with a new-found confidence under our current manager. He had been a bit of a scapegoat at times but this season – especially since Christmas – he has more than proved his worth. Nine goals in all competitions, who would have thought it? The lad can finish and he works tirelessly for the cause. The Scot deserves huge praise for his efforts, and a big well done to each and every one of his team mates too. One player I haven’t mentioned there is Leighton Baines, I left him out for a reason because he is part of my final point. Baines was handed the captain’s armband after Osman had gone off injured and many might say he doesn’t seem like the most vocal lad on the pitch – or off it for that matter. However during the game against Arsenal Baines proved he does have those leadership qualities, and he is a vastly experienced part of this Football Club. He played well both defensively and offensively but during the second half there was a moment that typified our performance yesterday and spirit overall. Barkley lost possession to Arteta in our half and then stupidly pushed the Spaniard over. I say stupidly because it could easily have been a red card, but as it went Atkinson missed it and Arteta went chasing after the blues youngster and the argument continued up the pitch. Barkley refused to get into a scuffle and when the ref tried to get a hold of the situation Baines came over and told Arteta straight. The Everton left back proudly stuck up for his team-mate and even though Barkley was in the wrong in the first place, I felt immensely proud from seeing Baines’ reaction. He doesn’t tend to say much or make a fuss at all when playing does Bainesy, but him pointing in Arteta’s face and telling the Spaniard to leave Barkley alone just epitomised the spirit and togetherness not just within this squad but within those four stands of Goodison Park yesterday. Captain v Captain, Baines the outright winner. It really was the perfect day for Evertonians and as I wrote a few weeks back, bring on the challenge from now until the end of the season, we have won six on the spin in the league and still have a number of games to contend with, a lot can happen. Our players are up for it, the manager is too, and our fans showed yesterday that they are right behind this royal blue revolution that is engulfing our Football Club. You couldn’t ask for much more from everyone associated with Everton yesterday and as I write this I can feel the hairs on the back of my neck standing up, I truly felt proud and elated by what I saw from my team and I have every faith that this is just the beginning of something big for Everton FC. To be perfectly honest, I think it has already arrived.